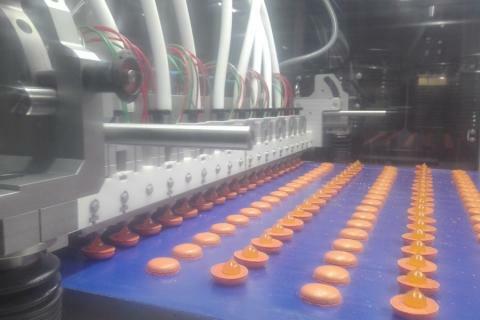 The full-width “capper” sandwiching machine is used for the production of sandwiches using round, square or rectangular biscuits. Available in short or long versions, it can accommodate up to four mobile depositing/capping heads. Dosing of cream, jam, chocolate, caramel, mallow, etc. using spot or layer technology with motion-tracking devices. No product/no dosing function. Possibility to make triple sandwich (e.g. alfajores), co-deposit with several flavours in one product or different flavours in the same row. Procys pays close attention to all your production issues (quick size changes, modification of parameters during production), maintenance (strong construction, standard components) and cleaning (hygienic design, cleaning in place). Cream feeding in simple or double jacketed. Modification of settings during production with different access levels for operators, line manager or maintenance technicians.